Clockwise from top left: Theresa and George Freygang, the author's parents, in 1882. (Theresa was the daughter of a restaurateur from down the block on West Broadway); the building at 249 West Broadway that housed the Freygang's pharmacy and family. The original address was 131 West Broadway; the pharmacy business card. This was Tribeca before the turn of the 20th century, in the words of someone who was there. In the 1960s, Walter Henry Freygang (1890-1981) wrote down his reminiscences of growing up above his father’s pharmacy at 249 West Broadway, one building south of Walker Street. His father, George Freygang,was born in 1855 on the second floor of a building at the southwest corner of Reade and Hudson streets and attended what then was P.S. 44 at Varick and North Moore streets. At 17, George's father, Gustav W., took him to the family's native city of Heidelberg to apprentice with a pharmacist and study at the University of Heidelberg. In 1883, a few years after returning to the U.S., George Freygang's father bought him a pharmacy at 249 West Broadway for $15,056.67. 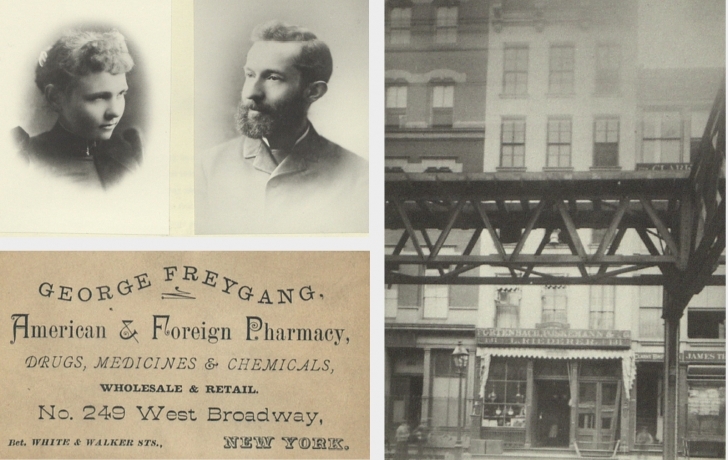 Here are Walter Freygang’s wonderfully detailed recollections of the family’s 16 years at 249 West Broadway, and the operation of the 19th century pharmacy run by his father. The text, edited for length, and photographs were provided to the Trib by Walter’s granddaughter, Katherine Freygang, a long-time Tribeca resident. In 1860, my father George Freygang moved his pharmacy and living quarters to what is now 249 West Broadway. Like its neighboring buildings, it was a loft with no plaster, lighting, plumbing or heat—merely beams with floors placed on them. A sidewalk elevator gave access to the basement. In the window, there were colored liquids in the conventional apothecarian glassware and sponges. Not until Thomas A. Edison set up a generating station on Duane Street in 1879, was the store and the living quarters wired for that "new Edison invention." Ours was one of the first buildings in the neighborhood to have electric light, but there was no electricity above the second floor. The store also had one of the first telephones installed, a desk with large glass batteries that the telephone company recharged every few months. If one became impatient after turning the crank for the operator, a boy's voice would say, "Keep your shirt on." Inside the pharmacy was a long counter stacked with various ingredients for prescriptions, which the customer could see being compounded. Inside a large covered crock were leeches; if the cover was left off, the cat would fish out a leech for a midday snack. Every drugstore at that time carried leeches to cure black eyes. At the rear of the store was a compounding laboratory with a steam boiler with steam kettles on each side. Big, black ants were imported from Africa and put into the steam kettles to make some medicine. The ants contained formic acid. There was also a soda fountain but there was no ice cream. The lab­oratory was used to make the syrups for the fountain. The lemon phosphate was the favorite. Pineapples and oranges were brought in by the crate to be made into syrups. My mother used to complain bitterly when they cooked some aloes which gave off a bitter odor and settled in your throat. This odor made her sick. The basement was always damp, unfriendly, with a low ceiling. In the part under the sidewalk, glass was set in the sidewalk permitting daylight to enter. This is where the cylinders of carbon dioxide would be connected to cylinders of water and set on a cradle. We could sit on that cradle and shake them to carbonate the water for the soda fountain. In this vault under the sidewalk Gustav W. L. put as many negroes as he could during the Civil War draft riots. Negroes at that time were being murdered. The houses on Beach Street occupied by negroes were burned and Gatling guns were set up at Canal Street pointing down West Broadway, Broadway, and other streets to provide protection against the rioters. The second floor was our living quarters. My brother, Gus, and I had a double bed. There was no window in this room, or in the bathroom or dining room. Behind our bedroom was a very small room, which was the dining room and at the rear was the master bedroom, where Pa and Ma slept, that had two windows. There was a large mirror set at about 45° outside of one of the windows so that the daylight could be reflected inside. In a little hall room was a kitchen with a coal stove and a sink. A round wooden wash tub was carried in for baths. The bath on Saturday night was a ritual. A fire was made in the boiler. We would make fire extinguishers using a bottle with a cork that could accommodate a bent glass tube. Bicarbonate of soda and tartaric acid were put into it and water added. This would shoot out a little stream of the mixture and we would put it through the open door of the furnace. After the furnace got going, steam was piped up to the second floor and the hose was put into the bathtub and hot water and steam were injected into the water. It made quite a racket. Working in the pharmacy was my father, the first clerk, a second clerk, a janitor porter and an errand boy. The first clerk had a room on the third floor so he could take care of some of the night calls. On the upper floors, there were also many barrels with a variety of buds, herbs and roots, crockery with salves, jars in which to grow narcissus, as well as candle molds. From the laboratory there was a five-feet-wide alleyway that led to Walker Street. Behind 1 and 3 Walker Street we stored a barrel of al­cohol and a barrel of gasoline. There was also a toilet where all the old almanacs were always hung on a hook for proper use. My father, being strictly a prescription compounder, was very much set against patent medicine, so-called prepared medicine. He did sell a headache powder known as Freygang's Headache Powder and it was sold in a good quantity. The formula was in his recipe book.When other stores cut a price, it used to make my father very angry. My brother and I would then have to walk many blocks to a place where you could buy Hood's sars­aparilla cheaper than he could buy it wholesale. Once a month school board meetings for Public School 44, of which my father was chairman, were held at 249 West Broadway. Another member of the board was Henry Neumann who had a restaurant at 131 West Broadway. Little did he know then that he would be my father-in-law. I often heard it said that the talk in the neighborhood when his daughter Nettie was born in 1895 was, "What do you know, Henry Neumann had a child after five years and it was only a gir1." My father's business hours were from 7 in the morning until 10 at night. He was always angry if someone would ring the night bell and wake him for a bottle of citrate of magnesia for 25 cents. When we first moved to West Broadway, the neighborhood was a good section, with businesses interspersed with residences. But when the Sixth Avenue el was built on West Broadway in 1877, it ruined the street, and it became dark with smoke and noise from the steam engines, and it was not at all pleasant. As youngsters, particularly when we were ill, we used to sit at the front windows and keep a record of the number of each locomotive to see how long it would take for them to come back, but for some reason or another, I don't recall finding out whether the locomotive ever did come back. After his retirement, my father had a rigid daily routine. He arose at 8 a.m., had coffee and a roll or cake, read his paper, then sifted his ashes, cut the wood, ate dinner at 12 noon sharp, took a nap, had coffee at 3 p.m. Then lighting his cigar, he took care of his correspondence and financial affairs, at 4 p.m. went to the “spelunka" for a drink. He loved dives, never a high class saloon. He ate supper at 6, then read the evening paper, and about 8 p.m. drank a bottle of beer or a glass of wine, and at 10 o'clock sharp went to bed. This schedule could not vary by 15 minutes. During his business years and even after this, he fought progress. The drug business changed but he would not. Manufacturing and importing were taken over by larger companies and his trade in these fields vanished. The result was that he became a retailer in what was getting to be more and more a wholesale district, and the volume of business between 1883 and 1900 dropped to less than one half. He would never permit my brother Gus or me to become pharmacists, and on September 1, 1900 he either sold or gave away the business. I say gave because I cannot find an entry of any money received. I recall clearly seeing my mother walking from the rear of the store to the street door the evening we left, with a stern face and her eyes filled with tears. I was happy to go and asked her what was the trouble. She replied, "After being here for 17 years, I can't help it."